In the recent past, the campus had its second renaissance. Around the world many new types of campuses were constructed. And new strategies employed, to avoid the “mistakes” of the past. It seemed that the campus was and is the solution to all spatial and organisational problems of an institution. But the campus lost hereby its specificity. This thesis studies the potential of the traditional campus, an architectural type that has the potential to act as a complementary city centre. 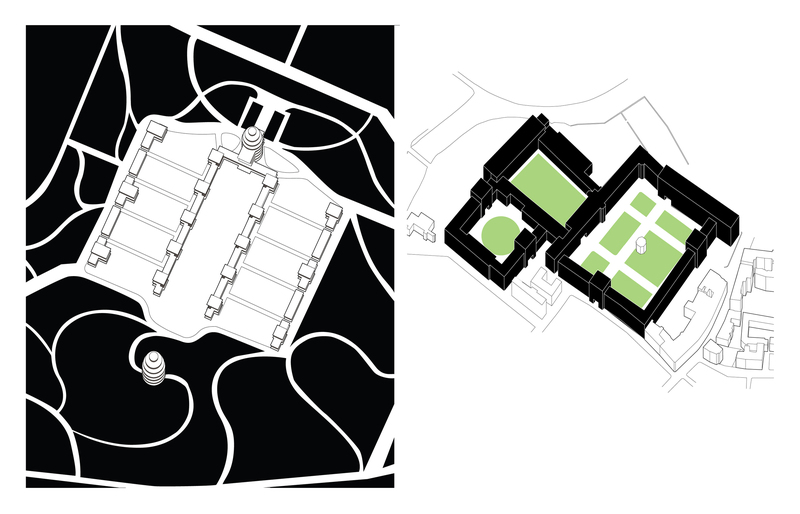 Because of a long history and unique relation of knowledge to the city, I chose the ETH and Zurich as my site of experimentation and as an illustration of the strengths and weaknesses of the campus. The campus has similarities with the city. Its organisational and structural principles are used to design an environment for a community. Yet in distinction to the city, the campus is only a fragment unable on its own to create an urban condition of diversity and density. It is a centre for a knowledge-based community and acts as a complementary element to the existing urban fabric. The campus has two architectural characters, which enable it to function as an urban element and simultaneously as an autonomous centre. They depend on architectural elements that both separate and concentrate space. The greenfield campus, such as the University of Virginia, was formally a ‘platform’ and spatially defined by its surrounding. It is an element of concentration. In comparison, Kings College, an inner city campus in Cambridge, is an element of separation, a centre that is different from its surrounding urban fabric. In both instances, a distinction between the centre for knowledge and centre for the common community is maintained. In the case of Virginia through the street and distance to any settlement, and in Cambridge through the wall. The campus is a type with specific architectural elements, such as the platform and wall, which create a distinct relation between the common city and the knowledge community. The campus can therefore be understood as an architectural that creates spaces of separation and connection. 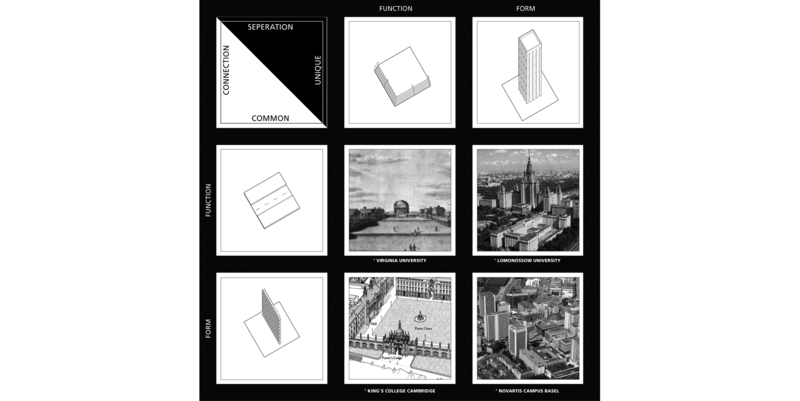 During the development of the ETH, four interpretations of the campus and its relation to the urban fabric emerge, which respond to changing definitions of knowledge and its relation to the public. In 1865 Gottfried Semper completed the main building of the ETH (Polytechnikum). Situated on the mountain side of Zurich, the building was placed above the existing city, symbolising the new established academic institution and community. Its ambition was to educate a privileged group of future leaders for the newly formed Swiss federation. In the 1960s, the rising demand of knowledge workers fundamentally changed the understanding of the academic while political reforms made higher education availed to a wider public. To cope with the rising number of students, the ETH built additional facilities in a greenfiled site, creating a series of knowledge campuses for the city which were to represent and fulfil a new academic curriculum. 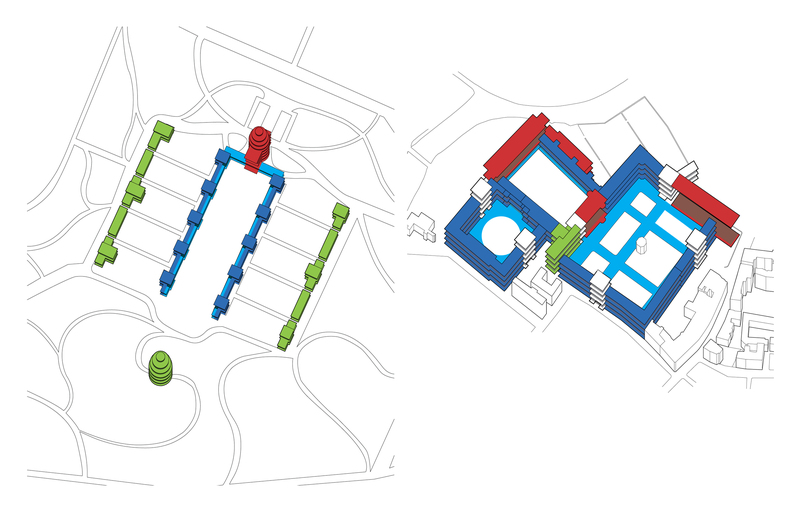 Each department had its own campus, designed to form a centre space but also to be legibly separate from each other. The recent substantial rise in student numbers has resulted in a growing number of knowledge campuses. The campus, formerly defined by its interior concentration or separation from the urban, changed into an urban condition itself. While previously the campus was specifically designed for an academic community it became the urban centre, or rather, the urban centre became the campus. 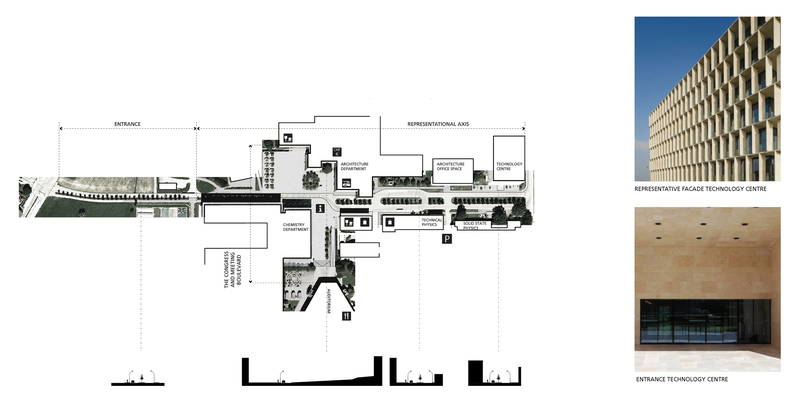 With this, the campus with a specific architecture was redefined as a generic space. 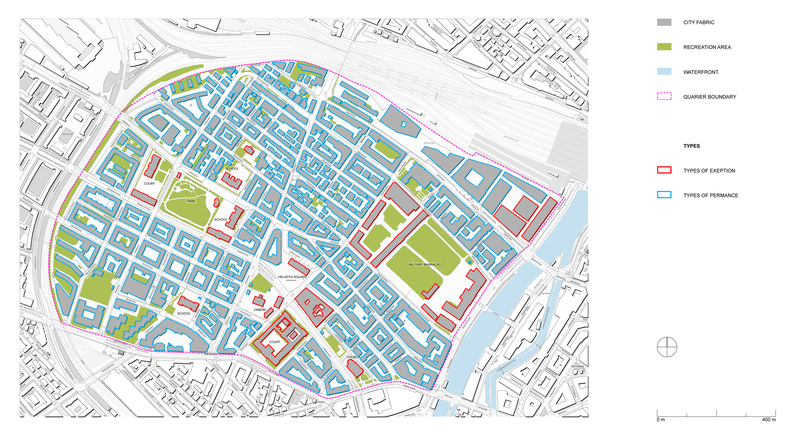 The campuses of the ETH were reorganised according to a street model in an attempt to mirror the urban condition and to connect and unify individual campus in a new shared ‘urban’ campus. The intention of the new campus was to establish an urban centre. The new urban reading of the campus created a different understanding of the physical academic space. 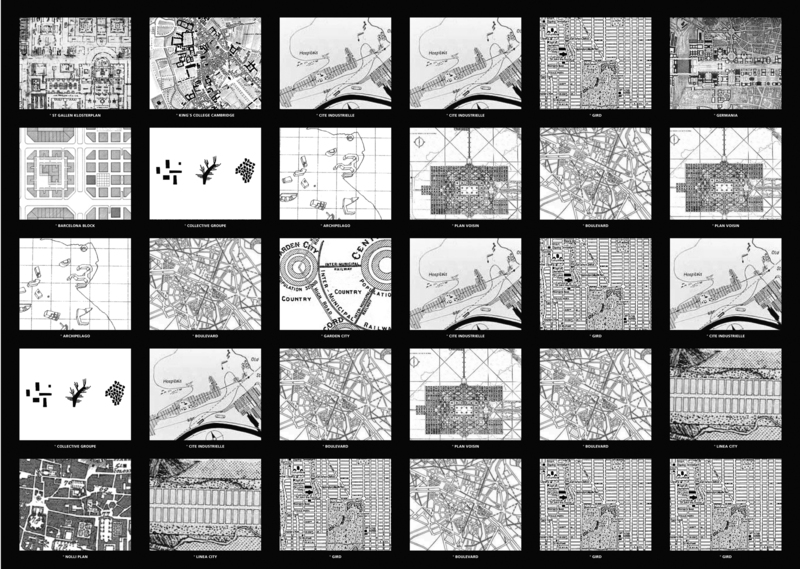 Arranged along a linear urban centrality, the nodes of the rebranded Science City no longer maintained a hierarchy or specificity and consequently academic buildings could be redefined as generic offices. The campus was transformed into a fragment of the city, more specifically a generic business district with generic office buildings. This radically changed the relationship between the ETH and the city. And it was only consequent that recently the ETH would move several of its departments into the existing urban fabric, as their own campus had become a promise of an urbanity that could be easily and better found outside. The city campus, as in the example of Werk 11, is now defined as a ‘symbiotic district’ in which a density of knowledge and related service industries exists. The city became the campus. 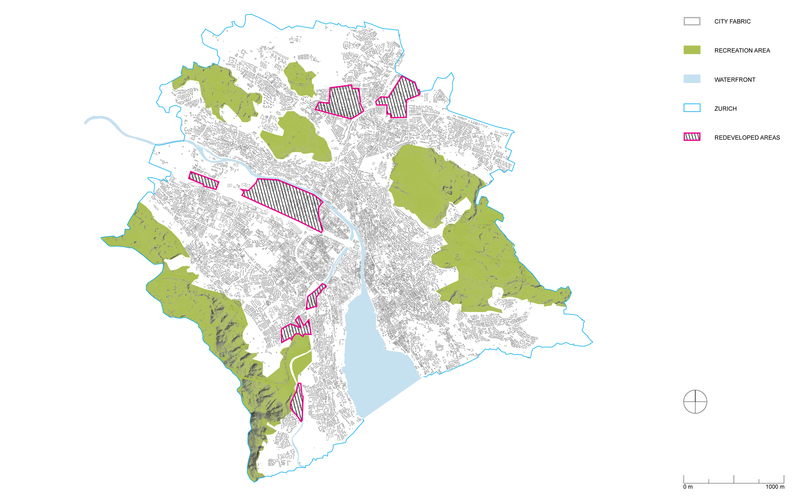 Lacking an overall master plan, Zurich’s urban formation is the construct of autonomous fragments that have become arranged into a large, homogenous field. However, Zurich remains a construct of a city within a city. 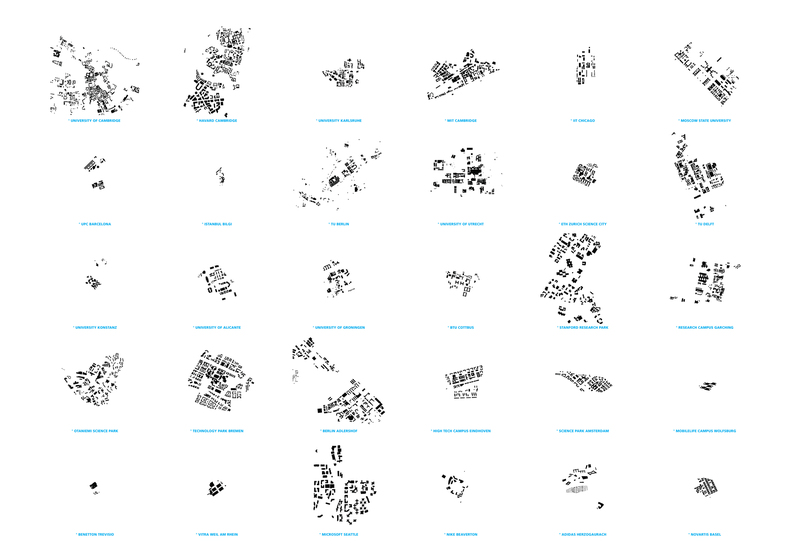 In comparison, the urban structure of each fragment–urban quarter—shows no specific articulation of architectural elements. 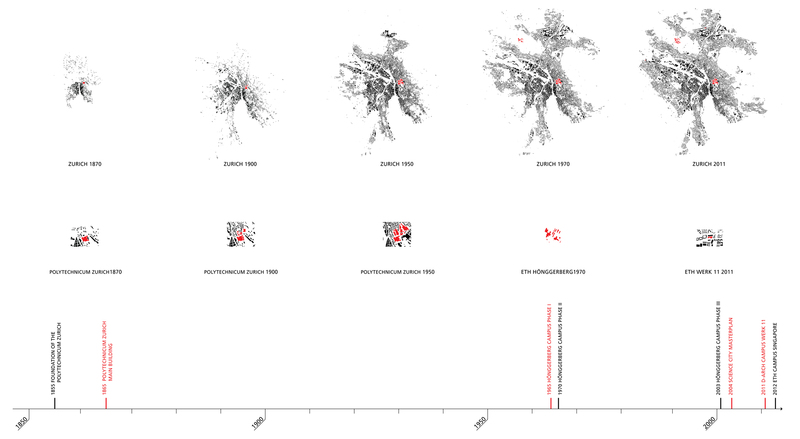 Types of permanence and exception are almost evenly distributed throughout the urban fabric. Thus, all quarters are a homogenous fabric. However, within each quarter, architectural elements create an internal hierarchy of organisation and orientation. Zurich is a city with the longest stable political situation in Europe and its unique urban development was, since the 14th century, continuously driven by private economic organisations that led to a thriving service and knowledge economy. Unlike other medieval cities in Europe, Zurich’s urban structure is not based on the articulation of unifying architectural elements, such as the city wall. Instead, the dominant structuring element since its beginnings has been the street and its urban development shaped along main trading roads. Yet Zurich’s origins also go back to its abbeys, which formed centres of voids, which were separated from the development of the city. They were a space for a knowledge and faith community. 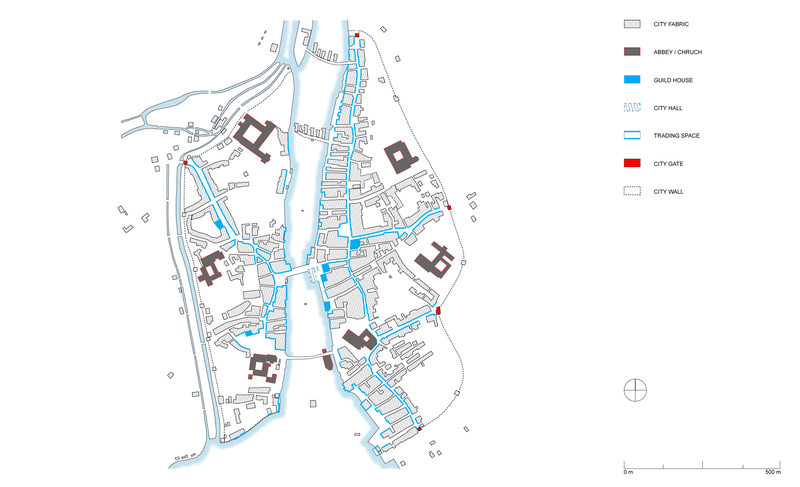 Therefore, the street can be read not just as an element of distribution and connection, but also as the element through which centrality is established, while at the same time the city had urban centres, such as the abbeys, that were not integrated and remained separate, similar to the campus model of Cambridge. The street in other words, can both create a separation and a concentration. The urban fabric of the quarter consists of two different centralities: the economic and public centre, defined by the street, and the centre for knowledge, the campus or abbey. 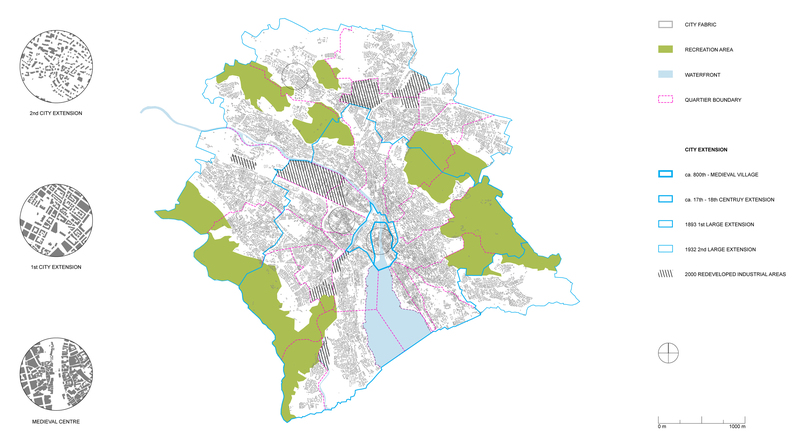 Within the urban fabric both centralities are complementary yet distinct from each other. Recently, a different idea of centrality was implemented. 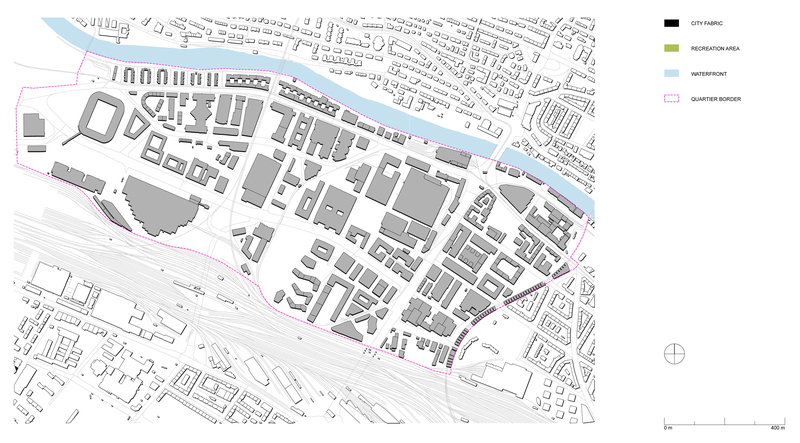 Post-industrial areas were transformed by inserting knowledge economies with the intention to create formal, spatial, and programmatic difference and to make centralities legible in conventional terms. In these new centres, post-industrial buildings were converted and created ‘inverted’ building types with no relation to the street. It fundamentally changed the role of the street, which became reduced to the function of distribution and lost its meaning as a centrality. 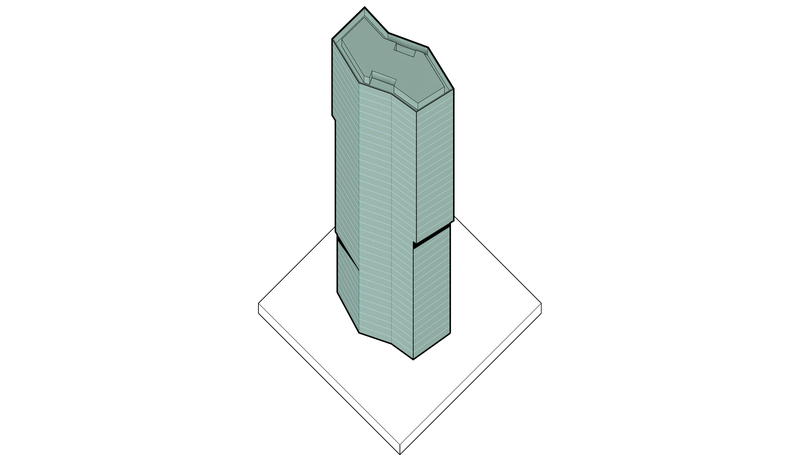 Another example of the new centre is the construction of the first tower. It created a new urban hierarchy based on size and visibility, which was previously unknown, apart from the first ETH building by Semper. 1. 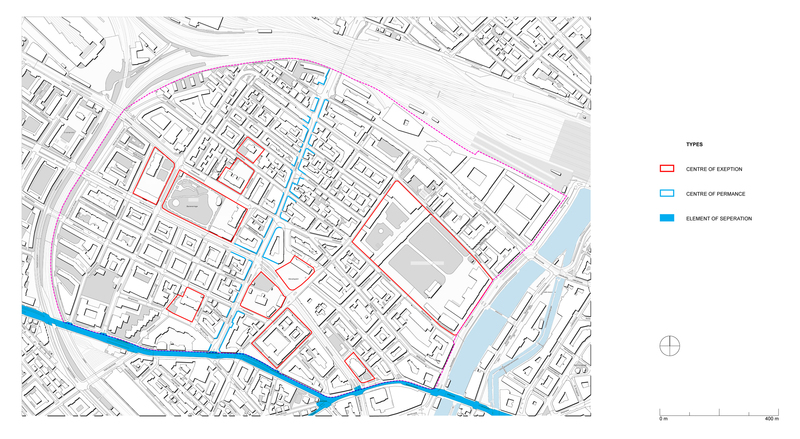 How can the city campus form centralities and complementarities that are consistent with the urban structure Zurich? 2. 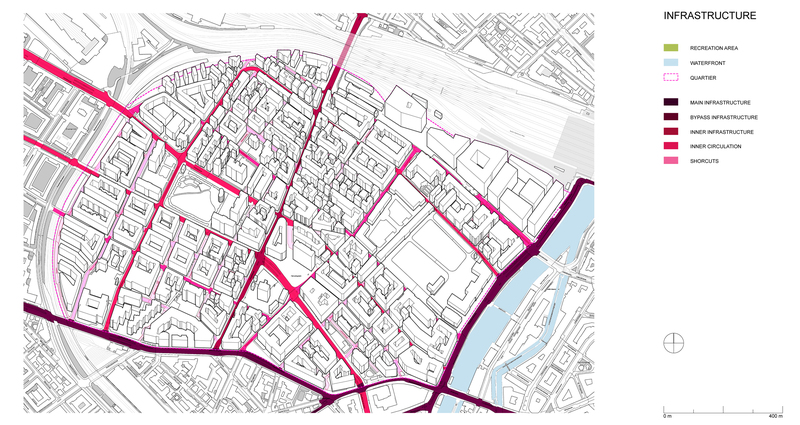 What are the relations of the city campus to the quarter and its centre, how can it be concentrating and separating? 3. What are the spatial and organisational specificities of the architecture of knowledge?